Wesley Sneijder has expressed his sympathy for Bert van Marwijk following his dismissal from his post as coach of the Netherlands national team. The 60-year-old mutually agreed with the Dutch FA (KNVB) to terminate his contract following a disappointing Euro 2012 campaign in which Oranje finished bottom of Group B and failed to earn a single point from any of their three games. However, Sneijder was quick to defend Van Marwijk, who had previously enjoyed great success with the national team, guiding them to the 2010 World Cup final, where they were eventually defeated by Spain. "After we dropped out of the Euros a lot of things were said. It's a shame that a decision has already been made, it's very fast," he told NOS. "Van Marwijk has been always very positive with this group of players. We all know that it's very hard to be coach of a national squad. You have to not only deal with the media, but in Netherlands you have to deal with 16 million coaches at home. The pressure is huge." 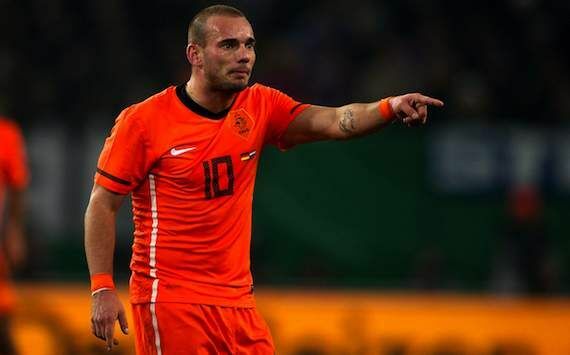 The 28-year-old Sneijder also revealed that he is not yet thinking about who will succeed Van Marjwik. "I just walked in to a restaurant and I'm bombarded by text messages and phone calls," he added. "For me, and I think for everyone, this is new. I don't have a clue who the new coach will be."